This is a fairly strong start to a great paranormal series. Like many other series, Harrison just jumps right in and it almost feels like we're coming in at the middle of the story. The book starts with Rachel quitting her job at the IS and then she must survive the subsequent death contract. She moves in with her friends, Ivy the vampire and Jenks the pixy. If you don't like reading about spells and witchcraft, this series is not for you, because Rachel spends a lot of time "stirring spells" as she calls it. It took me a few chapters to really "get" this story. Harrison doesn't exactly spell things out for her readers, no pun intended. Kim Harrison weaves a story with plenty of humor, magic, adventure, and steam to delight any reader. 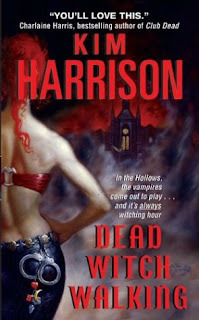 If you like Charlene Harris or Laurell K. Hamilton, you'll love Kim Harrison! I thoroughly enjoyed this book (read it in one sitting) and can't wait for the sequel.